In December of 1796, a new work of Jewish thought was published, authored by one of the greatest minds of the time, Rabbi Schneur Zalman, founder of Chabad. Within a few years the Tanya revolutionized the Jewish community of Russia and its impact was felt throughout Eastern Europe and beyond. The Tanya was published many times during the 19th and 20th centuries as the need arose. It’s been translated into multiple languages and scores of volumes of commentary have been written to make it more accessible to a wider audience. In early 1984, the Rebbe launched a campaign to have Tanyas printed all over the world. The idea was to bring an infusion of spiritual energy to each community. In 1984 a Tanya was printed in our community in Long Beach, NY. However now with the establishment of Chabad of the Beaches whose sole purpose is to spread light of Judaism throughout our community to levels never seen before, we are preparing to print our very own Tanya edition. Over 6,000 editions have been printed in nearly every nook and cranny all over the world. The Rebbe explained the tremendous positive impact the printing of Tanya has on each location or institution that it is printed, as well as showers blessings on all who involve themselves in the printing. 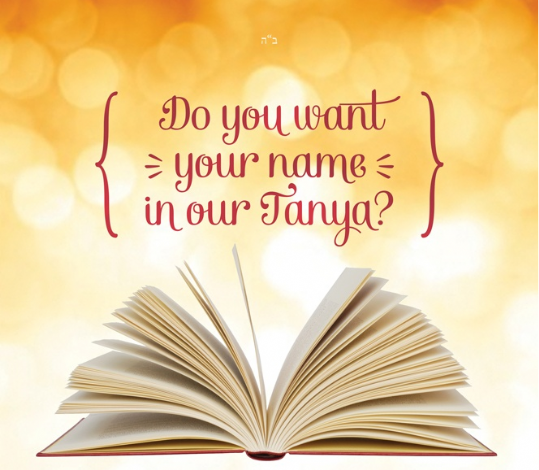 It is a special merit to participate in its printing, we are offering all members of the community to have their name included in the back of the Long Beach edition of Tanya at the cost of $36 per name. Those wishing to merit and be part of the official sponsorship pages, a donation of $360 is requested. To participate in this extraordinary event please email me at rabbi@chabadofthebeaches.com. For each name please include the English spelling of the family name as well as the Hebrew name for each family member and their mother's Hebrew name. Dedication Names For each name please include the English spelling of the family name as well as the Hebrew name for each family member and their mother's Hebrew name.